The university is required to designate campus community members who are responsible for reporting incidents of sexual misconduct to the Title IX Coordinator for the purpose of conducting an investigation into the situation. Once a Responsible Employee knows or reasonably should know of possible sexual misconduct, the university is deemed to have notice of it, and is obligated to investigate and take appropriate action. As such, immediate reporting is crucial. Sexual misconduct includes sexual harassment, dating violence, domestic violence, stalking and sexual assault. Not all University Employees are designated as Responsible Employees. Most UNL faculty and staff members are not Responsible Employees. Only those individuals identified by title on this webpage are required to take action or report incidents of sexual misconduct. 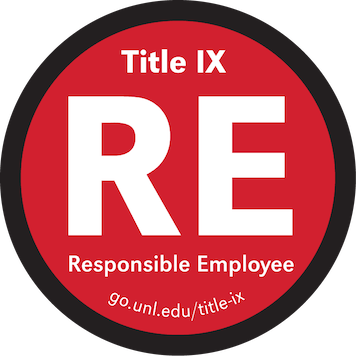 The university encourages all other university employees and faculty members to: (1) assist a UNL community member with reporting to the Title IX Coordinator and/or local law enforcement; and/or (2) assist a community member by directing the individual to resource and reporting options; (3) and/or report concerns to your supervisor or the Title IX Coordinator. Before an individual reveals information the individual wishes to keep confidential, make sure the individual understands the Responsible Employee’s obligation to report the names of the parties and relevant facts to the Title IX Coordinator, and an inability to keep the information confidential. Inform the individual that the Title IX Coordinator or designee will be contacting them if allegations are shared. Provide the individual with a list of confidential resources (i.e. CAPS, Victim Advocate, Women’s Center counselors, etc.). Inform the individual of UNL’s limited ability to respond to a complaint where the person wants to remain confidential, if the person indicates such a desire. Do not promise confidentiality. The university will consider a request for confidentiality, but may not be able to grant or maintain it depending on the circumstances. Encourage the person to seek medical care if the situation involves sexual assault or other bodily harm. Inform the individual of the right to file a separate criminal complaint with campus or local law enforcement. Inform the individual of the right to be free from retaliation for filing a complaint. Inform the individual of the importance of preserving evidence, even if the person may not be considering reporting at the present time. Immediately report the sexual misconduct allegations or situation in accordance with the Title IX reporting structure within your department/College or directly to the Title IX Coordinator. Report the situation to campus police if you are identified as a Campus Security Authority and if the situation is a reportable crime under the Clery Act. Generally speaking, all individuals with the following in their titles will be Title IX Responsible Employees for the purposes of Title IX: Dean, Associate Dean, Director, Associate Director, Assistant Director, Manager, Department Chair and Department Head. Specifically, individuals with the following titles are Responsible Employees and are: (1) required to report situations of sexual misconduct to the Office of Institutional Equity and Compliance; and (2) inform the reporting party of resources (Confidential and community resources) and reporting options (i.e. police, IEC). Any faculty member leading, coordinating or supervising an education abroad program or any other university-sponsored international travel. If no faculty member is traveling with the group, another UNL employee traveling with the group, in consultation with the director of Education Abroad, must be designated as the Responsible Employee. Any faculty member leading, coordinating or supervising off-campus academic activities or programs such as study abroad programs, special field trips, etc. Any employees who have management or supervisory level duties involving hiring, termination and/or discipline related decisions. Staff members who interact with or assist students or employees with Title IX issues must report to the Director.